Today the focus was on tapping into student voice to engage learners and allow for learning to be personalised. 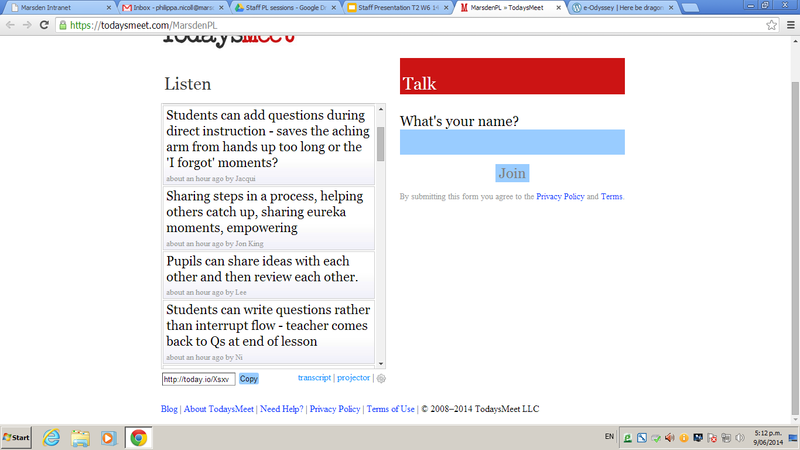 To run alongside the session I created a ‘TodaysMeet‘ backchannel. I invited staff in, get them multiple ways to access the Meet, and gave them time during the session to use the backchannel to suggest ideas or give answers. This seemed engaging, and people were interested in it as a tool. It goes to show that having something interactive is a winner! I also offered a repeat of the Google Drive/Google Docs workshop. I enjoy these when there is a help sheet for staff to follow along and then I can just respond on the fly to what people need. This was my experience this afternoon. Today’s workshop also reminded me that people do not learn new skills by osmosis. They need time to learn, to play, and to have questions answered. As always, it is dangerous to assume a base-level of knowledge. Reflection: ‘Is the Sage on the Stage Really Dead’? Something I’ve been enjoying is listening to podcasts on my morning walk (Wellington weather permitting…). Friday morning’s podcast was asking whether or not the ‘sage on the stage’ model of teaching was really dead. To be fair, the speakers’ responses clearly indicated that it is not, as they were mostly giving advice on how to move away from direct instructional teaching methods to more guiding or facilitating of students. Some of the comments I heard really got me thinking and reflecting on my own practice. The comment that had the most impact on me was the thought that many teachers agreed with the need to shift from ‘sage’ to ‘guide’ from an ideological view point, but found it difficult to enact from a practical stand point. Hands up. No, just me then? This comment really encapsulates my fear when looking to move forward pedagogically next year. I’m in the process of writing programmes for my classes in 2014, but what if they’re not ‘flipped’ enough, or provide enough authentic context, or seek to provoke genuine engagement… And I’m meant to be leading professional learning with this stuff? Yikes! In a way it’s really difficult to imagine what a student-centred classroom would look like when you’ve never experienced it yourself. I’ve moved so much from when I first started this journey – from being a reluctant adopter, motivated essentially extrinsically due to the fact that my school was moving to BYOD and I would hate to see laptops as expensive electronic exercise books and pens, to being a raving enthusiast. But. I’ve yet to implement any of the stuff I’m likely to advocate. I guess I just have to live in hope that my fear will be my saving grace. That, as one participant in the podcast said, where there’s a will; there’s a way. I’ll consider the advice I gleaned from the chat: ‘ask, don’t tell’ – how can I pose questions to lead students towards information rather than rely on me for direct instruction? I kind of like the idea of setting the daily homework assignment of students asking a question about their learning every day – preferably in an online environment – which could help me to guide further learning, and, if I track the questions over time, to help me develop question-asking skills in learners. Because, ultimately students don’t need us to be their source of information. They have Google and Wikipedia for that. We need to provoke students into asking their own questions, and to help them find or use the tools to explore their own answers. As teachers, we know that we need to ask the (dreaded?) high order questions to spark in-depth thinking, engagement and evaluation. These kinds of questions help us to connect to the critical thinking and creativity we want to teach to embed future learning principles and skills. Better yet – make these into posters for around the classroom walls, and get the students asking these questions of themselves, their peers, and … their teachers? !